"Iced heart-shaped cookies make a lovely gift for your Valentine. This recipe uses the flood technique with royal icing to achieve a gorgeous and smooth result that sets firmly." Cream 1 cup plus 2 tablespoons butter in a large bowl with an electric mixer. Add white sugar and lemon zest and mix well. Mix in eggs one at a time and beat well after each addition. Mix in 1/2 of the flour until combined. Mix in remaining flour until dough comes together. Shape dough with your hands into a thick rectangle. Press flat and wrap in plastic wrap. Refrigerate for 2 hours. Dust a work surface with flour and roll out dough into a thin circle. 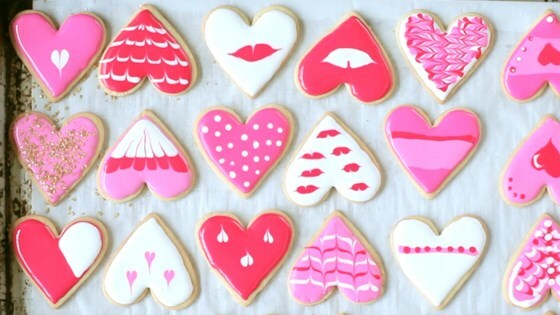 Cut out heart shapes and arrange cut-out cookies on the prepared baking sheets. Bake in the preheated oven until lightly browned, 10 to 15 minutes. Remove hearts from baking sheets carefully and transfer to wire racks. Cool completely, about 15 minutes. Beat egg whites in a bowl until frothy. Beat in confectioners' sugar, 1 tablespoon at a time, until stiff peaks form. Add lemon juice to thin out the mixture. Add more lemon juice for runnier icing. Divide icing into small bowls and color with red food coloring in different shades of red or pink, keeping a portion of the icing white. Cover with a damp kitchen towel at all times so it won't dry out. Decorate as you like using different techniques. For the flood technique, use runny royal icing in a piping bag with a small round #2 tip and pipe a line around the edge of the cookies. Fill in the center, evenly distributing the icing with a scriber tool. For hearts, add dots of a different color onto the wet icing and drag the scriber tool downwards through the dots. For lips, add an oval shape onto the wet icing and shape the oval into lips with the scriber tool. For feathers or patterns, pipe a line around the edge, then add stripes in different colors. Drag the scriber tool down through the stripes. For a marbled effect, pipe lines of different colors across a base layer, then drag the scriber tool up and down through the lines. Allow the icing to set completely. Baking time is often shorter after the first batch of cookies. This is the only demonstration on the whole All Recipes that shows you how to decorate a cookie with Royal Icing. Thank you it was very helpful. Love the video. very well made.